Dana Bowden's 2015 Category 13 entry. 29 Palms' oldest and most unique tradition now in its 78th year! noon to 4:00 p.m. on Sat (Nov. 3) and 10 a.m. to 4:00 p.m. on Sun (Nov. 4). Purple Glass - Arrangement using Museum Quality (flawless–see rules) purple glass as an accessory. FRESH PLANT MATERIAL ONLY IS USED IN THIS CATEGORY NO DRIED MATERIAL. Broken Purple Glass - Composition using Broken Purple glass (broken or imperfect) as an accessory. Composition using an item related to transportation as an accessory. Composition using weathered wood and rocks as an accessory. Composition using an item related to communication as an accessory. Composition using a photograph or photography item as an accessory. Composition using items relate to sports as an accessory. This is the no-holds-barred category. Anything goes but basic rules still apply. Kids up to 12 - Use your imagination. Oversized composition to be staged outside. You may create your entry to be oversize but any entry which exceeds the length, width, height, or weight limitations set out in the rules will be placed outside. The rules are really quite simple, but if you have any questions please contact the committee member at the telephone number or email address listed below. 1. You can only have ONE entry per category. 3. Each entry MUST have an accessory to fit the category, as indicated in the category descriptions. 5. No artificial plants allowed. No live or dead critters allowed. 6. Your entry must be solid and stable enough to permit handling by a committee member. Only a committee member will be allowed to reposition a display. Construction paper or mat board may be used to complement your entry. 7. The maximum size for indoor entries is 20"x16" and no more than 24" high with a maximum weight limit of 10 lbs. Larger or heavier entries will automatically be staged outside on the front porch and will be unattended. Each outside entry must be strong enough to withstand wind and weather. 8. Category 1 is an ARRANGEMENT which uses ONLY fresh plant material, not necessarily native plants. Museum quality means flawless--in perfect condition as manufactured. 9. All other categories are COMPOSITIONS which may include fresh desert plant material together with a dried desert plant in its natural state, that is, not varnished or painted. A composition can also use dried desert plants exclusively. 10. Category 11 is ONLY for children 12 years of age and under. Entries must conform to the general rules of height and weight. Children may enter any other category but will be judged with the adults. 11. Entries must be brought to the museum between the hours of 4:00 and 6:00 p.m. on Friday, November 2 or Saturday, November 3 from 7:00 to 9:00 a.m. NO LATE ENTRIES WILL BE ACCEPTED. Everything must be assembled and completed by 9:15 a.m. NO EXCEPTIONS. Judging is from 9:30 a.m. to noon on Saturday. 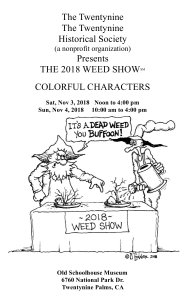 The Weed Show is open to the public from noon to 4:00 p.m. on Sat (Nov 3) and 10 a.m. to 4:00 p.m. on Sun (Nov 4). Entries must be picked up between 4:00 and 5 p.m. Sunday, Nov 4. Please, no early pickups. The Twentynine Palms Historical Society is not responsible for loss, damage or unclaimed entries. Please forward this page to any folks you may know who might be interested in attending or entering the weed show. All are welcome. Click on the image above to download and print a brochure with the rules and categories.